Precitec Optronik from Germany has launched the newest member of its line of non-contact optical thickness sensors, CHRocodile K, at K 2013.CHRocodile K is designed to meet the measurement needs for manufacturers of plastic films, preforms, PET bottles, blisters (PET, PP, EVOH), balloons and other plastic parts. A significant benefit is the optimization of the measuring range to that most commonly seen in plastic materials, meaning that the user now has a sensor with the exact functionality required. Precitec Optronik says the high measurement speed allows for 100% control, inline as well as offline. Variations during the production process are seen in real time, before they can have an impact on the production quality. Its compact optical probe requires access from only one side and can be easily integrated into a confined space. The robust measuring technology delivers accurate results in all environmental conditions. One of the applications of CHRocodile K is for production of balloons that are used in cardiology for dilation of constrictions in coronary blood vessels. The thickness of the wall determines that strength, and by detecting thin spots, the weakness can be isolated. 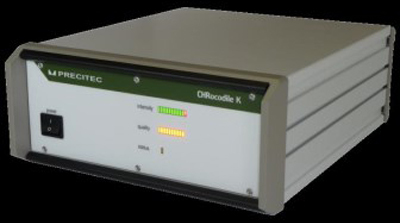 The CHRocodile K sensor provides reliable, non-contact measuring data of the lining and taper area of the balloon. The high speed measurement and compact head design facilitates easy integration into inspection machines for use in both production lines and laboratories.